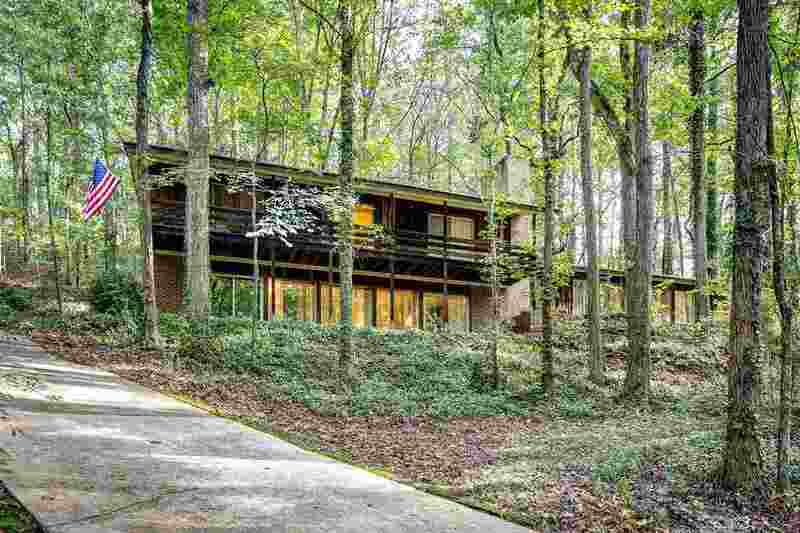 4208 Stone River Rd, Mountain Brook, AL.| MLS# 826014 | Richard Jacks UABLIVING.com 205-910-2297 | Birmingham AL Real Estate | Contact us to request more information about our Homes for Sale in the Birmingham AL area. Entering over a quaint bridge, buyers will discover a beautiful Mid-Century modern, tri-level home with private 1.4 acre lot featuring Cherokee Bend schools. From the VAULTED ceilings with EXPOSED beams to walls covered in windows and an open floor plan, this home is a true piece of art. The home also features 5 bedrooms, a master suite and plenty of space to entertain, including a breakfast nook, separate dining room, and finished daylight basement (stubbed for an additional bath). Outside, there is plenty of space to be enjoyed including a second floor deck spanning the entire length of the home and a patio overlooking the woods and creek located just off the kitchen. Buyers can also enjoy the peaceful sound of running water from the creek on property. The home has been meticulously built and maintained by one family and no detail was overlooked. With room to spare and a private lot, this home certainly won&apos;t last long. Call and schedule your showing TODAY! Driving Directions: Old Leeds Road To Stone River. Home Is On The Right.